During his tenure as president, Tatsuro Toyoda struggled with an economic slump in Japan and a streak of sliding earnings. 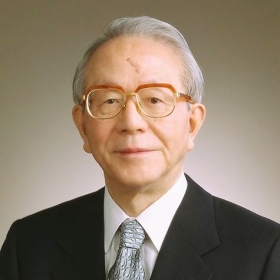 TOKYO -- Tatsuro Toyoda, the second son of Toyota Motor’s founder whose short tenure as president of the company in the 1990s was marked by health issues, has died. He was 88. Toyoda died Dec. 30 of pneumonia, the company said Saturday. Tatsuro, a son of founder Kiichiro Toyoda and uncle of current President Akio Toyoda, took the helm of the family’s namesake automaker in mid-1992 from elder brother Shoichiro, who piloted Toyota’s rampant global expansion. But whereas Shoichiro served as president for a decade, Tatsuro lasted just three years. The younger sibling stepped aside abruptly in 1995 after a prolonged hospitalization for reported hypertension. The company at the time described Toyoda as fighting high blood pressure but it was speculated that he had suffered a mild stroke. Toyoda collapsed while attending a meeting of the Japan Automobile Dealers Association on Feb. 24, 1995, and remained hospitalized until resigning in August that year. His departure paved the way for Hiroshi Okuda to become the first Toyota president from outside the family since 1967. Okuda's appointment ushered in an era of three consecutive outside presidents that would last until 2009 when current president Akio restored family control. 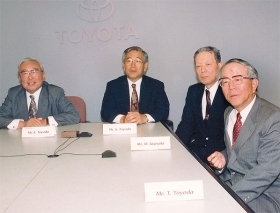 Toyota President Tatsuro Toyoda, right, with, from left, Honorary Chairman Eiji Toyoda, Chairman Shoichiro Toyoda and Vice Chairman Masami Iwasaki, in an undated photo. During his tenure as president, Tatsuro struggled with an economic downturn in Japan and an earnings slump that were undercut by falling sales and shrinking share in the home market. Before becoming head of the parent company, Toyoda served as the first president of Toyota’s pioneering joint-venture assembly plant with General Motors, the New United Motor Manufacturing facility in Fremont, California, which began production in 1984. The plant was Toyota’s first experiment with manufacturing in the U.S., and gave it confidence for going solo on such ventures as its sprawling Georgetown assembly plant in Kentucky. Toyoda’s task was the difficult one of introducing Japanese manufacturing techniques while maintaining the trust and morale of NUMMI’s unionized American workforce. His success in getting the venture off the ground opened the door for Toyota’s foray into U.S. production. Toyota announced in 2009 it would close NUMMI after cash-strapped GM withdrew from the joint venture in the wake of the global financial crisis. The plant was later sold to Tesla. Toyoda earned a degree in mechanical engineering from Japan’s prestigious University of Tokyo and later received an MBA from New York University, where he studied under the famed quality-control guru W. Edwards Deming. Most of his career was focused on overseas marketing. After stepping down as president, he served as vice chairman for several years. A private vigil and funeral has been held by close relatives, Toyota said. The company said it plans to hold a farewell gathering at a later date.